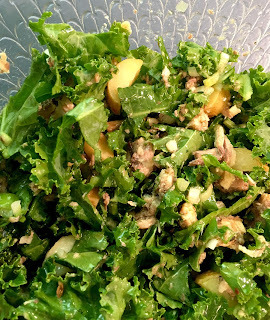 Until I had this sardine salad at a local restaurant a while back I never would have thought of using sardines this way, now I do all the time. And they’re a whole lot healthier and more flavorful than canned tuna. Give it a chance you sardine haters out there…you never know. Cut some white potatoes into small chunks and simmer in salted water until fork tender, then run under some cold water to cool and drain. Empty a can of whole sardines along with the oil they’re packed in into a large bowl and chop up into little pieces with the side of a large spoon. Towel dry the potato chunks, then add to the bowl along with some chopped kale, sliced scallion, a small pour of extra virgin olive oil, fresh lemon juice, and salt and pepper to taste.